In these Laws:-1.1 References to the “Laws” shall be references to The Laws of Tennis (1998 Revision) as from time to time amended or supplemented with the approval of the Tennis Committee of the Tennis and Rackets Association.1.2 From time to time the Association, host club or the organisers of an event may lay down special rules relating to a Court, a match or to a tournament. In such an event, the Laws of Tennis shall prevail except where they are inconsistent with those rules. 1.3 Subject to Law 21 (The REFEREE), the decision of the Marker in any match as to the interpretation of the Laws shall be final. In matches where there is no Marker, all calls or other decisions that would otherwise be made by a Marker shall be agreed between the players and these Laws shall be construed accordingly. If no agreement can be reached, a Let shall be played. 1.4 Without prejudice to Law 1.3, the Association may, from time to time, promulgate guidance notes for Markers and Referees. Such notes shall not form a part of the Laws and, in the event of an inconsistency between the Laws and such guidance notes, the Laws shall prevail. (c) references to a defined term which is a verb shall include all appropriate tenses of that verb. In these Laws each of the following terms shall bear the meaning set opposite it in this section.The Association The Tennis and Rackets Association.Back Walls The walls adjoining the Main Wall between the floor and the penthouse and between the penthouse and the Out of Court Line. Bandeau The strip of wall immediately below a penthouse, usually made of the same material as the penthouse. Chase See Law 9, which contains all definitions relating to Chases. Court The enclosure in which the game is played. (e) Time is called by the Marker. Dedans The Opening in the Back Wall on the Service Side. Drop A ball is said to Drop when, after passing the Net, it bounces for the first time on the floor. (c) after having Dropped and without thereafter being struck, it bounces for the second time on the floor or touches the Net on the far side from that on which the ball was originally struck. A ball landing in the Nick after having Dropped is deemed to have hit a wall before Falling. Fault Line The line on the floor nearest the Grille and extending from the Service Line to the Grille Wall. (b) on the Hazard Side:- Hazard the First Gallery, Hazard the Door, Hazard the Second Gallery and the Winning Gallery. Gallery Post The post between two Galleries. A Gallery Post is considered to be part of the Gallery nearer the Net. The part of the netting that surrounds a Gallery Post is treated as being a part of that post. Grille The Opening in the Grille Wall. Grille Wall The Back Wall on the Hazard Side below the penthouse. Half-Court Line The line on the floor within the Service Court running from the Back Wall on the Hazard Side to the Service Line half-way between the Main Wall and the Side Wall. Hazard Court The floor of the Court on the Hazard Side from the Net up to, but excluding the ServiceLine. Hazard Side The side of the Court on the left of the Net when facing the Main Wall. In Play A ball served is In Play until it becomes Dead. Ledge The lower horizontal surface of a wall that surrounds an Opening. Line The notional line at the Net on the floor of the Court separating the Service Side from the Hazard Side. (It may originally have been the line that supports the Net). Line Opening An Opening on either side of the Net Post between the Net Post and the First Gallery or Hazard the First Gallery. Main Wall The wall that has no penthouse. Net Post The post supporting the Net under the Side Penthouse. Nick The junction of any wall and the floor of the Court. A ball is also said to be a “Nick” when the ball, as it Drops or Falls, touches a wall and the floor simultaneously. Opening The Line Opening and any Gallery or Winning Opening. (d) in the case of the Grille, touches the woodwork (or other material) forming the back of the framing of the Grille. (c) exceptionally where the Court has no roof, touches anything outside the Court or anything which forms the exterior of the Court. Out of Court Line The line marking the upper limit of the Court. Passing the Net A ball passes the Net when it crosses from one side of the Court to the other. Receiver The player who is to take the Service. Rest A stroke or series of strokes, commencing when the ball is Served and terminating when the ball is Dead. Server The Server is the player who delivers or is to deliver the Service from time to time. Service The method of starting a Rest. Service Court The part of the floor on the Hazard Side that is bordered by the Side Wall, the Grille Wall, the Fault Line and the Service Line (including those two lines). Service Line The line on the floor of the Court which is nearest and parallel to the Grille Wall. Service Penthouse That part of the Side Penthouse, which is on the Hazard Side including the line that,bisects the Side Penthouse. Service Side The side of the Court on the right of the Net when facing the Main Wall. Service Wall The wall above the Side Penthouse up to, but excluding, the Out of Court Line. Side Penthouse The penthouse opposite the Main Wall up to its junction with the other penthouses. Striker The player who last struck the ball. Tambour The projection on the Main Wall near the Grille. (The whole of the projection should be called the Tambour though the term is more commonly applied only to that part of it that is at an angle to the Main Wall). Tray The inner part of the bottom of an Opening behind the Ledge, usually made of wood. Winning Gallery The Last Gallery on the Hazard Side. Winning Openings The Deadens, the Grille and the Winning Gallery. The balls shall not be less than 2 7/16 inches (62 mm) and not more than 2 9/16 inches (65 mm) in diameter. They shall not be less than 2 1/2 ounces (71 gms) and not more than 2 3/4 ounces (78 gms) in weight. 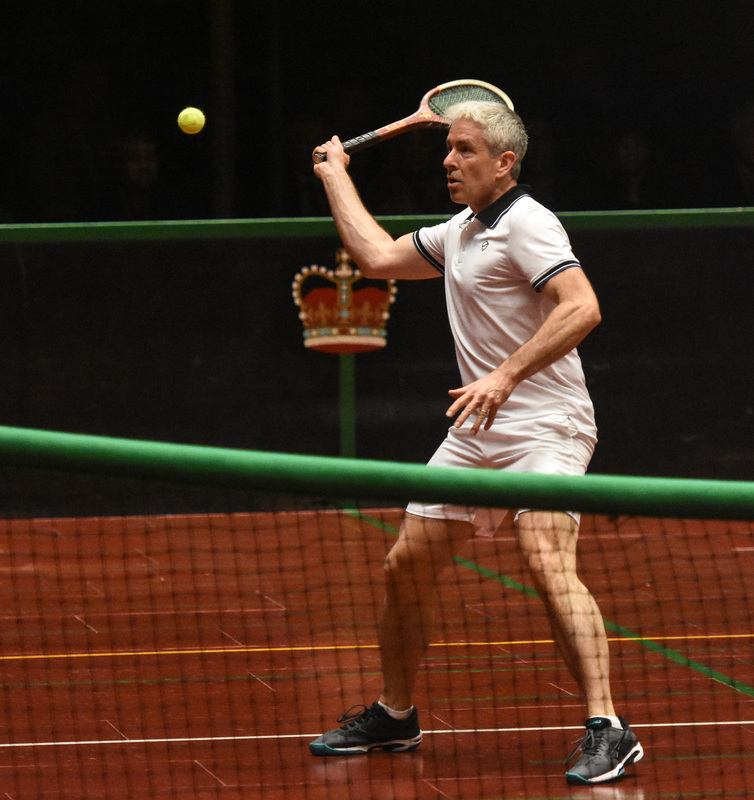 Unless, exceptionally, the Association approves another specification, racket frames shall be asymmetric as traditionally designed for Real Tennis. They shall be made almost entirely of wood, but may include essential laminates made of other materials. The internal dimensions of the head shall not exceed nine and a half inches (241 mm) in length by seven inches (178 mm) in width and the overall length of the racket shall not exceed 27 inches (68 cm). Chase Lines are lines normally painted on the floor to enable the Marker to mark the Chases and are located as follows:-(a) on the Service Side, proceeding from the Back Wall towards the Net:- Half-a-Yard, One Yard, One and Two (describing the Half-yard line between the one yard line and the two yard line) and so on up to Six, then Half-a-Yard Worse than Six, the Last Gallery, Half-a-Yard Worse than the Last Gallery, A Yard Worse than the Last Gallery, the Second Gallery, the Door, and the First Gallery, and(b) in the Hazard Court, proceeding from the Service Line towards the Net:- Hazard Half-a-Yard, Hazard One Yard, Hazard One and Two, Hazard Two Yards, Hazard the Second Gallery, Hazard the Door and Hazard the First Gallery. 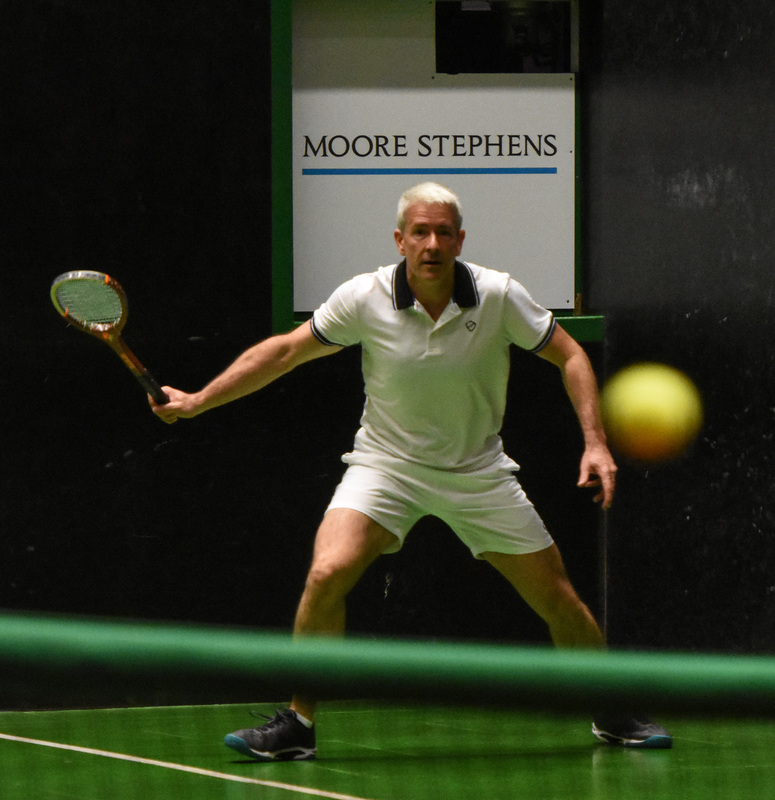 (h) if the ball served, after striking the Service Penthouse and without then having first been volleyed, Drops anywhere except in the Service Court or in the Winning Gallery. If the Receiver is not ready for a Service and does not attempt to take it, a Let (Law 10) shall be allowed, subject always to the provisions of Law Law16a) – Continuous Play. (a) During a match the players shall change sides when two Chases have been made or when any player is at forty or advantage and one Chase has been made. (iv) Any Chase outstanding after either player has won the game shall be annulled. (b) nearer to that line than to any other yard or Gallery line. Chase A Chase is made whenever the ball Falls in the Hazard Court, or Falls anywhere on the Service Side, or enters the Line Opening or any Gallery, except the Winning Gallery. Chase the Line The Chase made when the ball enters the Line Opening. On the floor it is the area between the Net and the First Gallery Line excluding that line. A ball which Drops on the Service Side and then Falls on the Hazard Side is also marked Chase the Line. Hazard Chase A Chase made on the Hazard Side of the Court. Marking a Chase A Chase is marked at the point where the ball Falls. 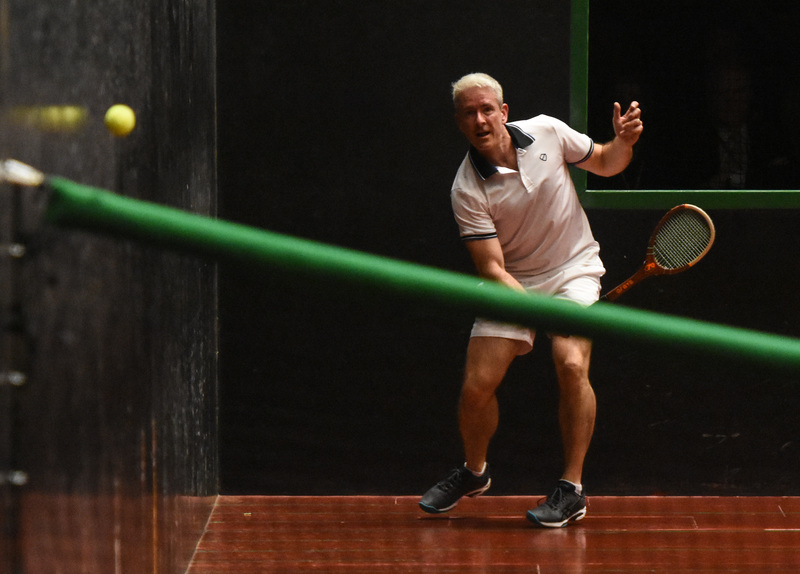 (a) When no Chase is being played for, a Chase is made if the ball, whilst In Play, enters the Line Opening or any Gallery (except the Winning Gallery) or Falls on the floor of the Court anywhere on the Service Side or within the Hazard Court. When a Chase is made the score in strokes relating to that Rest shall be unaltered until that Chase is played for (Law 9.3). (v) when it Drops or Falls on another ball or other item on the floor (not being a player’s racket or any item of a player’s clothing or equipment used or carried by that player in the course of that Rest), it makes a Chase as if it had Fallen where that ball or item was lying. (vi) when it strikes the Marker, having previously passed the Net, it makes a Chase as if it had Fallen where the Marker was situate at the time of impact. (a) When the players change sides in accordance with Law 8.2 the Chase or Chases shall be played for immediately in the order in which they were made. The winner of each Chase shall win the point. Unless there is a Let (law 10) a Chase shall be played for once only. (vi) if the player Attacking the Chase makes a Chase equal to the one being played for it is Chase Off and the score remains unaltered. (iii) if through any mistake, at the end of a game there is a Chase that has been made and not played for, that Chase is annulled. then play a Let. The Marker may also allow a Let promptly upon completion of a Rest if he considers it equitable so to do. No appeal shall be allowed by any player against such decision. (iii) if there was a previous Service fault, that fault is not annulled. (b) a ball In Play struck by him after passing the Net, enters a Winning Opening or Falls on the Hazard Side between the Service Line and the Grill Wall or on the Service Line. (j) a ball In Play struck by him, after Passing the Net, comes back and Drops on the side of the Court from which it was struck by that player (even if the ball touches the Net before so Dropping). (b) In all matches where a Handicap is played and in such other matches where the tournament rules so provide, the score shall be called “forty all” instead of deuce and the player who wins the next point shall win the game. The score of the player winning the point shall be called first. The player who first wins six games in a set wins that set, unless a different number of games has been stipulated. 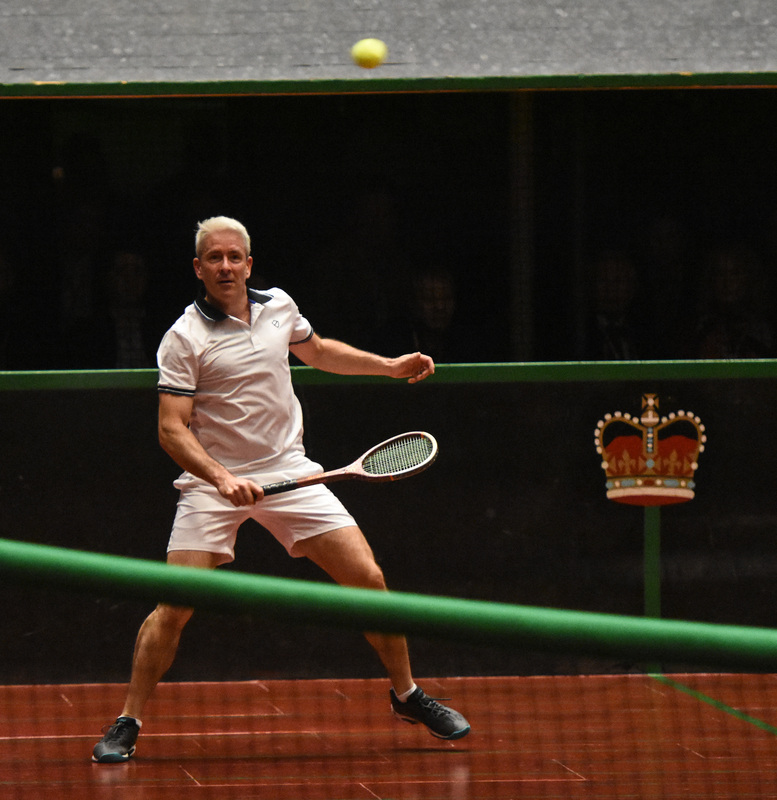 The Laws for singles matches apply equally to doubles matches and players are, with the following variations, in all cases subject to the same Laws as a player in a singles match.14.1 Choosing Server and ReceiverBefore commencing each set the players on the Service Side shall select which player is to serve. The players on the Hazard Side shall then select which player is to receive Service. The selected players are then the Server and Receiver for their sides throughout the first game and for odd games throughout the set. Their partners are Server and Receiver in the even games. A return of Service is not good if made by the Receiver’s partner, unless the ball has Dropped in the Service Court between the Half-Court Line and the Fault Line or on either of those lines. The Servers partner shall not stand in such a position, when the Server is serving, as to prevent the Receiver from having a clear view of the Server and the ball. If the Receiver’s view is obscured and he does not attempt to take the serve, a Let shall be allowed. If an incorrect player serves, whether or not the correct Receiver returns the Service, the Marker shall call a fault, but if the error goes unnoticed, then all completed Rests shall stand as if correctly scored. If an incorrect player returns Service from the correct Server, the Marker shall call a stroke against that player except in cases where the ball Drops in the Service Court between the Half Court Line and the Fault Line or on either of those lines. If an error goes unnoticed, then all completed Rests shall stand as if correctly scored. In addition to the circumstances described in Law 11.2, a player loses the point if a ball struck by him hits his partner or anything his partner is wearing or carrying. (f) Not behave in any way likely to bring the game into disrepute. (a) After the first Service has been delivered, play shall be continuous and, having regard to all the circumstances, reasonably expeditious unless the Marker (or the Referee if this task has been allocated to the Referee) decides otherwise. (b) No player may leave the Court without the express permission of the Marker (or the Referee if this task has been allocated to the Referee) and then only for a good reason and for the shortest possible time. (c) seek clarification from the Marker or the Referee (if this task has been allocated to the Referee) on points of law. Markers and Referees shall be appointed by the Event Organisers. A Referee may be appointed at any time considered appropriate by the Event Organisers or whenever the Marker requests one. If a player wishes a Referee to be appointed, he shall make such request before the start of a match to the Event Organisers whose decision, whether or not to appoint a Referee for that match shall be final. (b) to notify the players whenever a Referee is appointed and inform the players of any variation in the duties delegated to the Referee from those set out in Law 21.1. (iv) to ensure that the ball troughs used by the Server are replenished. (viii) calling points won and lost; (ix) keeping and calling the score; (x) giving clarification, when asked to do so, on points of law. (d) to ensure that the Laws relating to the Conduct of Players (Law 15) and Continuous Play (Law 16) are complied with. (e) to ensure that spectators do not disturb the players. Unless the conditions of a match or tournament regulations allow otherwise, the Marker shall stand in the Markers Box at the entrance to the Court. If the Marker is marking from the Dedans, the player on the Hazard Side shall mark Hazard Chases except where an additional Marker is appointed for that purpose. 21.1 The Duties and Responsibilities of a RefereeThe principal duties and responsibilities of a Referee shall be:-(a) to be well versed in the Laws, any guidelines for Markers and Referees promulgated from time to time by the Association and any specific rules relating to the relevant match or tournament. (iv) to give clarification when asked to do so on points of law. (vi) to ensure that spectators do not disturb the players. Unless the conditions of a match or tournament regulations allow otherwise, the Referee shall be seated to the right of centre in the Dedans. (c) At his absolute discretion taking account of all the circumstances, to give a warning to any player and, if that warning is not heeded, to award the match to that player’s opponent. The Marker or, as the case may be, the Referee shall be free to exercise any or all of the foregoing powers at such time or times as he considers appropriate. The Handicaps most commonly used are those set out in this Law. In addition there are a number of long established Handicaps, which are set out under the heading “Cramped Odds” in the Glossary, but which are now infrequently used.23.1 Quarter OddsQuarter odds are played for in every fourth game of each set where they apply. When half odds Handicaps are played, the Handicap in the first game of each set is always that most favourable to the player conceding the Handicap. If a Handicap involves half odds received and owed, full odds when received will alternate with, rather than coincide with, full odds owed and vice versa, (e.g. receive half 15 owe half 30 is played love owe 30 in the first game, receive 15 owe 15 in the second game and so on). (d) if there are two Chases the players must change sides before the Bisque is taken to win or to defend either of them. (c) to add a second fault to one served by his opponent. Apart from (c) the conditions regarding taking a Bisque apply equally to a Half-Bisque. The Handicapper may give a Half-Bisque as being one Bisque in every alternate set, in which case the Bisque must be taken in the odd sets. The player giving the Handicap shall only be allowed one serve in each Rest. The player giving the Handicap shall lose the point if a ball struck by him before Falling, hits the oblique face of the Tambour. When a player gives a specified Chase, this applies only to a Chase on the Service Side unless the player is also giving a Chase on the Hazard Side. Any Chase made by the giver of the odds Worse than the one specified loses him a point (even when playing off a Hazard Chase). Any Chase made by the Receiver of the odds Worse than the one specified is considered equal to the one specified.